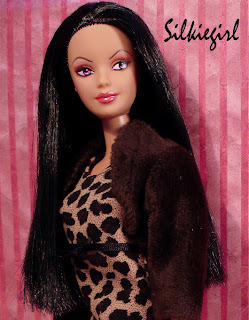 I know I included some other goodies in with the leopard print fashion, but I don't recall what those were either. That's okay, because I don't even remember what I received in this swap. Swaps can be so much fun to participate in, but it seems that a lot of that has just gone by the wayside like so many other things have. Don't worry, because Elektra still wears her original outfit when she is called upon to be the superhero she is. lol Oh....and she wears it for Halloween too, which will be here before we know it. Thanks for stopping by and visiting my blog. I hope you enjoyed this post. Please leave a comment for me. Hot August Summer Day in Cali! It has been so hot here this month, that I felt inspired to create a post with Barbie and Ken enjoying the cool water of their swimming pool. They stayed in the pool so long, that their skin started looking like wrinkled up raisins. 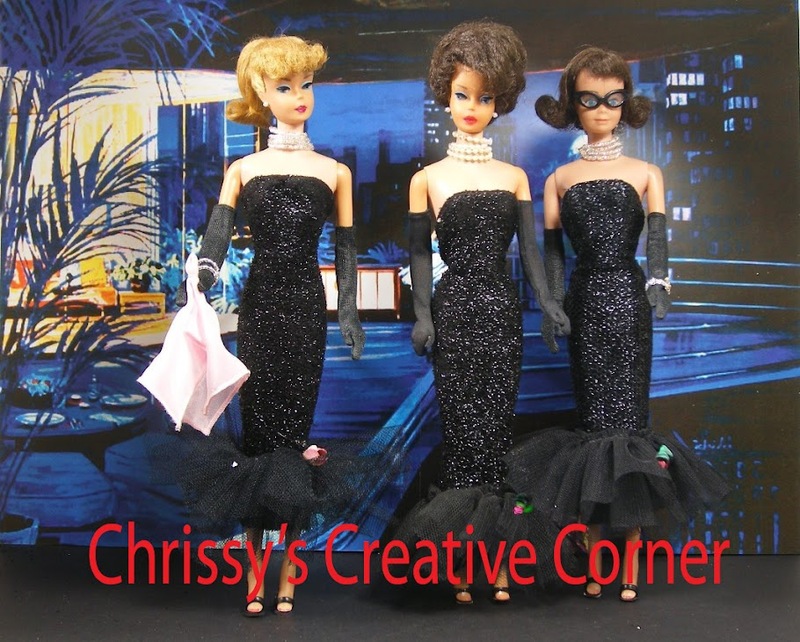 lol Also.....Marta from All 4 Barbie inspired me with one of her recent posts about some of her dolls swimming to cool off. Thanks Marta! I'm sorry if the photos seems a bit out of focus. My camera wasn't cooperating very well today, so the pics below are the best ones out of all the pics I took today. I hope you enjoyed my post today. Thanks so much for stopping by to visit me. Wow! 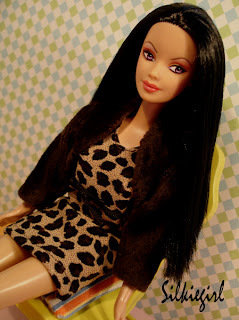 I can't believe it's been almost a whole month since I shared a new post. Life just seems to keep interfering with my blogging. lol Oh well.....life happens and there isn't much you can do except go with the flow. 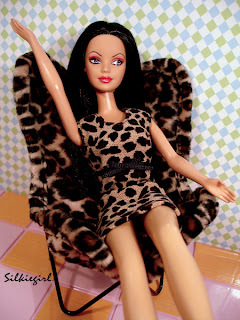 Today I thought I would share one of my favorite Barbie furniture pieces with you. The pics I'm about to share are coming from my archives, and I hope you enjoy. 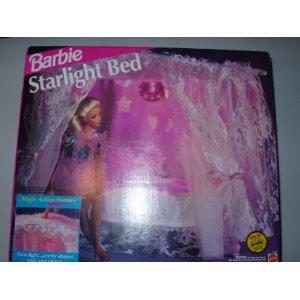 The Barbie Starlight bed is one of the best purchases I ever made, and I really do love this bed. I wish I could have it in human size for my own bedroom....that's how much I love it. 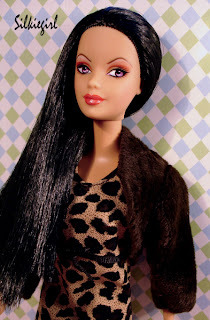 lol So....here it is........ Oh....you can see that I named Crystal Barbie....Lorissa. I had forgotten that until I searched for this picture. lol I do think the name fits her very well though. I'm sorry that the picture really doesn't do this bed justice at all. I did take this picture in the dark a few years ago to try and get the full effect from the "starlight" feature of this gorgeous bed. 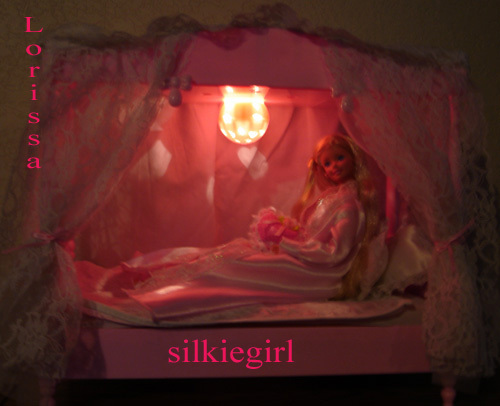 Crystal Barbie is loving her very comfortable prettyful bed. 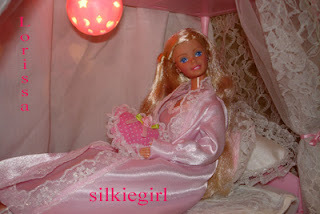 In this picture, you can get a bit better look at the bed(well....part of the bed) and the beautiful satin peignoir that Barbie is wearing....known as the collector Satin Dreams fashion from the Classique collection. Here is a picture that I "borrowed" from the internet so you could see the bed a bit better in it's entirety. It does appear that this picture is of the box, so thank you to whomever shared this picture on the internet. From this picture(left bottom), you can see there is a button on the top of the bed to push to turn the light on and off. I hope you have enjoyed this post, and please feel free to leave me a comment.